Halloween officially started in Sweden at 4:00 PM in my timezone yesterday. The Minecraft Halloween update was on time. That means I can finally start my new world and begin my mega-project I've been planning. I'm still keeping my old save, but I wanted to start a new world to take advantage of the new biomes feature. Deserts and forests and tundra, oh my! 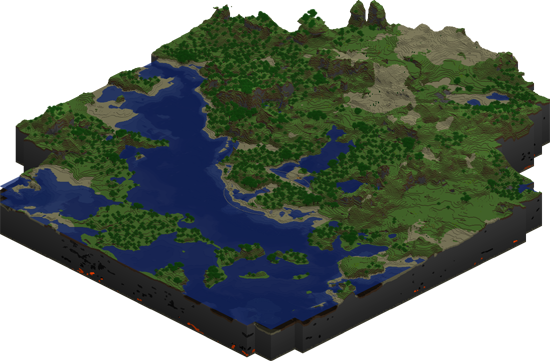 I generated a few worlds and explored a little to get the feel of Biomes. I finally settled on this world to start my mega-project in. This world has not generated any snowy biomes yet. If you look close you can see parts of a large circle towards the center of the map. It's the outline of my mega-project. @ Vid: It is... Say farewell to any quality blog posts for a while. They'll probably be random YouTube videos and pictures, posted at 4 am rather than my usual 12:01 am. @ Stratagem: No, I used Cartograph to make the isometric map. is there anyway to play minecraft alfha without paying? @ Anonymous (#6): Same way you could play any game without paying. However the chance of it having an embedded virus is not worth the risk to me. well how would u play online then?